​We know that you like your privacy. When you come to Hermann, MO, lodging quarters can be invasive if you're around people you don't know. We have taken care of that for you. The Cat Nap Inn Hermann wants your time to be as stress free as possible. That’s why we only rent out the house to a single group or party. If you rent 1 of our cozy bedrooms Monday thru Thursday, we offer you the entire house with a 2 night minimum. When you come with your friends and family, our home is your home. A deposit of 50% must be paid with a credit card at the time of reservation, the balance will be charged at the time of your stay, unless you work out other arrangements. Applicable Missouri and Hermann Sales Tax (8.1%) and Hermann Lodging Tax (3%). Please also note that due to the home’s age, it is not handicap accessible. Rental parties should be able to comfortably climb stairs. In order to receive a full refund, we request that you give us at least 14 days notice. A full refund (less the $25 processing fee) is available if notice is given more than 14 days and the rooms have been filled. We welcome you to smoke outside the house only. A cleaning fee will be charged if necessary for smoke or damages. Our check-in time is 3:00 pm and checkout is at 11:00 am. All of our rates are based on a maximum of 6 people. We hope you enjoy your stay and our beautiful and peaceful town. Because we have neighbors close by we ask that you respect their privacy and peacefulness as well. If we receive calls regarding the noise level we reserve the right to ask you to leave. We love our town of Hermann, MO and know that you will too once you come and stay with us. Bring your friends and family and enjoy our town on a quiet weekday or live in the life of the party on the weekends or during festivals. We can not wait to see you in the nicest Hermann Missouri lodging location in town. 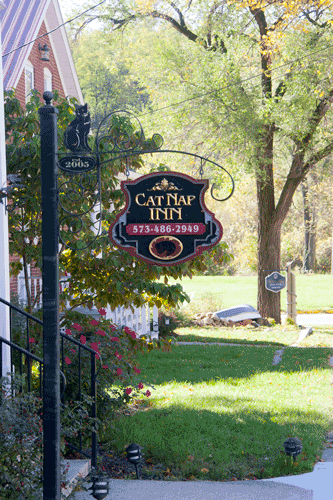 If you would like to contact our staff at the Cat Nap Inn Hermann please go to our contacts page.